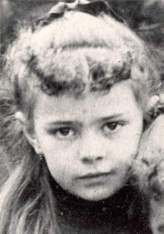 Elizabeth Catez was born in the military camp at Avord, France, where her father was a Captain. 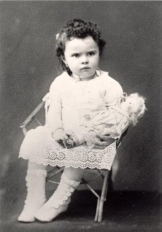 She was a vivacious and strong-willed child, as her photo here suggests. Her younger sister, Marguerite, had a more gentle temperament and the two were very close. When she was seven years old, tragedy hit the little family. Her father and her grandfather, who lived with them, both died that year. To cope with her reduced circumstances, Madame Catez and her two daughters moved to a smaller house in Dijon, near the Carmelite Monastery. 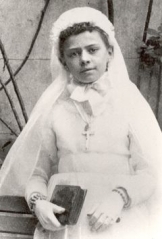 On the day of her First Holy Communion, the Prioress of the Carmel explained to Elizabeth that her name meant ‘House of God’ and that God did dwell in a mysterious way in her heart. This thought became very important to Elizabeth. Towards the end of her life she wrote, “It is this intimacy with Him ‘within’ which has been the beautiful sun illuminating my life”. 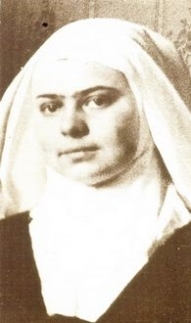 She felt drawn to dedicate her life to God, and the life of a Carmelite began to attract her strongly. Always a passionate and lively person, she made friends easily. She loved tennis and dancing and was enraptured by the beauty of the mountains which she saw on her holidays. But it was her music that occupied her most. 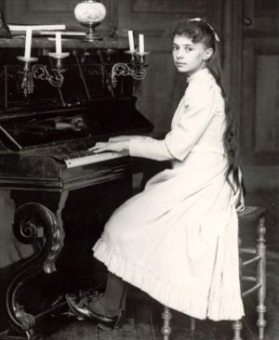 She was an accomplished pianist and on one occasion won first prize for her playing at the Dijon Conservatoire Elizabeth was faithful to her friends all her life. Many of her letters from Carmel were to them. 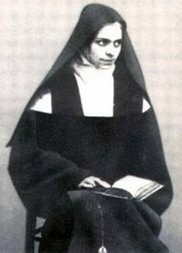 Elizabeth knew her Mother would not be happy with her Carmelite vocation and did not mention it until she was sixteen years old. Her Mother’s reply was instant and final, she was not to think of it for many years and she even forbade Elizabeth to visit the Carmel or speak to the nuns. A desolate and trying time followed, while she tried to reconcile herself to the difference between what was God’s will for her now and what she still felt was God’s call in her heart. Resigned now to a long wait, Elizabeth took part in the social life of her friends with Marguerite. She always dressed fashionably and well and was a welcome addition to any party, giving herself generously to all. However, those who watched her closely would see that, in the midst of the social whirl, she never lost sight of the One who dwelt in her heart. 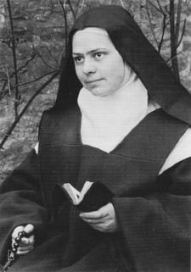 mother, Elizabeth began her formation to religious life while still living outside. Her prayer and recollection grew ever deeper. She gave herself with generosity to the needs of her mother and her sister, and already the virtues of a Carmelite were growing in her heart. mentioned the subject of Carmel, hoping that Elizabeth would forget about it. But then, finding her daughter still constant in her desires, she gave her permission at last, saying, however, that she must wait until she was twenty-one, “for you cannot in conscience leave your sister before then”. 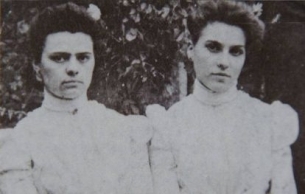 When Elizabeth crossed the threshold of Carmel on 2nd August 1901, it was with a mixture of great sorrow at the pain she was causing to those she was leaving behind, and of great joy at meeting her new sisters who were to be her new family in Carmel. She was overwhelmed with a strong sense of the presence of God and her first steps were lived in a very conscious union with him. This was to last for her first six months while she was a postulant. But immediately after her clothing, a darkness fell which was to last the whole year of her noviciate, until the very moment she made her vows. 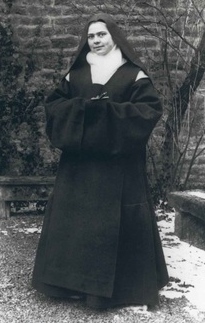 As she began her Retreat before Profession, the darkness deepened. During this year she had learned to live solely to please her Beloved without any consolation and she was ready to commit herself to this for the rest of her life. Those around her became anxious but she quietly and resolutely made her vows in the darkness of pure faith. The next day her peace returned, not the honeymoon joy of her first months, but a deep peace that would last the rest of her life. But her life in Carmel was not to be a long one. By the middle of 1905 Elizabeth’s health was already worsening. That she was ill was becoming apparent, even though she tried to carry on as normal. It was some time before the doctors were able to diagnose Addison’s disease, which was at that time incurable. The last months of her life were extremely heroic. 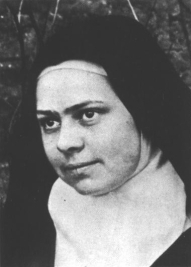 Her ideal now was to share in the passion of Christ and become like him in his death. It was the thought of his sufferings that helped her to bear her own. 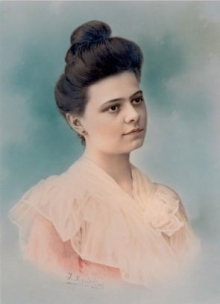 She went to God on 8th November 1906 saying in a sort of chant, “I am going to the Light, to Life, to Love”. She was beatified in 1984 and canonised on 16th October 2016. Into the depths of your mystery. Until I die of very love. that I may never wander from your light.